Rapunzel has a nasty sore throat and she must see a doctor right away. 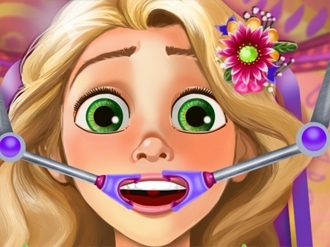 Have fun being Rapunzel's medic and start discovering all her throat problems. Get rid of the nasty bacteria using awesome doctor tools and make sure the princess feels better. Princess Sofia was riding a bike when suddenly that kid came running from around the corner! The accident was unavoidable. Now they both are in your hospital, and you are to treat their injuries as soon as possible. You are to decide whom to help first! Poor Rapunzel is suffering from eye problems. Her vision is getting blurred and unclear. She needs your help. Detect and clear all the problems with her eyes. Help her get the clear vision back. Insisting to build a snowman even though it was snowing heavily, Sofia caught a bad flu and she's now forced to stay inside. Make sure she is warm and cozy, give her the proper treatment and make sure Sofia's back on her feet again. One day Baby Cinderella was trying a pair of shoes on, as usual, and accidentally fell down and injured her leg. Help cute little Cinderella feel better. Put your doctor skills to work in this amazing game called Baby Cinderella Doctor!